Again, a robbery! In the center of Barcelona’s stolen Rolex 20 hours! 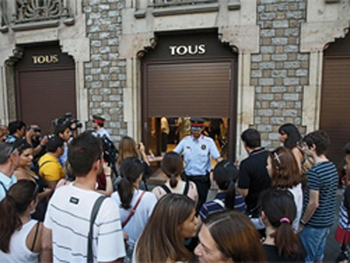 As some news sites, August 6 at the center of Barcelona was raided by the prestigious jewelry store Tous. The robbery was committed about six o’clock in the evening. It is known that participated in the raid six: four men in motorcycle helmets, suddenly burst into the shop, smashed display cases with hammers and took about two dozen watches Rolex. At the time of a robbery at the store was the only buyer who tried to stop the robbers, but the resistance was due to puncture wounds in the abdomen with a knife. Broke into the shop at the entrance waiting for two accomplices on motorcycles. Patrol officers were able to hold only one of the robbers, the other five – fled the scene on his motorcycle. The wounded man was taken to hospital visitors.